Peri | Randomwhoness: a Doctor Who blog by Johnny Spandrell. Sampling stories in random order. I am a little late responding to your letter in the Radio Times, 9-15 February 1985. To be fair, there were a few impediments to me to doing so. For a start, when your letter was published, I was only 10 years old and living in Nowhere, Australia. Also, I’d never heard of the Radio Times, its letters page or indeed, you. And on top of all that, I’ve only just become aware of your letter, via what is now, in the space year 2019, called a website. And if you think entering into correspondence about your thoughts on a program broadcast 34 years ago, expressed in reply to a letter which wasn’t addressed to you is both unusual and obsessive, well, you obviously haven’t met many Doctor Who fans. Doctor Who was the subject of your disgruntled letter back then. Specifically, the story which stoked your objections was Vengeance on Varos. You’ve probably forgotten all about it and gotten on with your life, like a norm. Good for you. But to jog your memory, VOV (as no one has ever called it) is about a dystopian society where capital punishment and torture are served up as entertainment to an oppressed public. The planet’s governor (Martin Jarvis) is trying to negotiate a trade deal with a capitalist slug called Sil (Nabil Shaban) but is hampered by a corrupt police state and regular public votes from the viewing public, which if lost, result in painful retribution. The Doctor (Colin Baker) and his friend Peri (Nicola Byrant) turn up and get caught up in all this. Your letter ends with the memorable phrase, “the kids deserve better than this…” and after reading it, I suddenly remembered that I was one of those kids. In 1985, I had made the transition from casual viewer to book collecting, t-shirt wearing fan. And I was just becoming aware of other Doctor Who fans and their complex organising principles. Through fan clubs and their newsletters, I knew what was coming up in Doctor Who’s 1985 season and I was looking forward to Vengeance on Varos. I knew that it had attracted some criticism about the levels of violence in it; I even remember worrying about whether it was going to edited for local transmission, or perhaps even omitted (Doctor Who‘s Australian broadcaster, ABC, had a habit of doing both these things). The things you worry about when you’re 10. Oddly enough, Doctor Who tended to worry its fans a great deal in 1985. Having just started to make contact with my fellow Whoheads and read their opinions in homemade fanzines (cheaply printed but lavished with extensive outrage), I was confused to find that most of my fellow TARDIS followers seemed to hate Doctor Who, at least in its current iteration. Which you might think is a contradictory position for people who loved something enough to form themselves into a fan club to take, but then, as I’ve speculated above, you’ve probably haven’t met many Doctor Who fans. Like you, they worried about its violence. But also, they worried about this new Doctor, dressed like a demented fairground attendant and with a fractured personality to match. His newfound tolerance for, and occasional participation in, violence signalled a relaxation of the Doctor’s moral code, and they hated it. On viewing VOV, fans concentrated their ire on the “acid bath scene” where the Doctor makes a tasteless quip after two men fall in a pool of acid, and the last of a string of set pieces in the planet’s “punishment dome,” where the Doctor engineers the deaths of two bad guys by slapping them with poisoned vines. (They didn’t worry that the only two black people in the show are voiceless, musclebound servants or that the only female characters are two housewives and Peri, costumed to accentuate her breasts, but there you go). But Harry, I’m here to tell you I survived the ordeal of watching VOV when I was 10. In fact, I loved it. It was my favourite of the season. At 10, I don’t think I could fully grasp the satirical points it was making about the corrosive effect both television and violence have on a society, or the dangers of tying government to populism – a message which seems particularly relevant in 2019. Mainly, I think, I liked the character of Sil, a slimy but hilarious business type, who laughed like a broken propeller when fortune deserted our heroes. Plus, the Doctor being bold and ingenious, and more prepared to dive into immediate action than his cautious predecessor. I certainly wouldn’t have been able to identify its faults and contradictions, most glaringly that it seems to be indulging in the sort of gratuitous gore it was busy criticising. But also that the Doctor and Peri take ages to arrive on Varos, with loads of valueless TARDIS scenes delaying their entrance into the story. There are a few dodgy performances. And special effects. And buggies. And mysteriously, two old men in nappies. But none of this stayed with young me, only the afterimage of an engaging and witty story, inhabiting some of the darker corners of Doctor Who, which I always liked to explore. What has the lasting effect of VOV been on me? Well, it didn’t scar me for life. It didn’t turn me into a violent sociopath. It has, along with the rest of that visceral 1985 season of Doctor Who, made me fonder of this difficult era of the show than most. That’s partly as a rebellious response to the vehemence of its critics I found inhabiting fan clubs; I’ve never liked being told what to like and their strident complaints served only to draw me closer to it, to search harder for the good stuff in it. I’m glad I did. But perhaps it also made me more tolerant than others of a sort of darker version of Doctor Who, one which can test its own boundaries about violence and grimness from time to time, as long as the Doctor’s core values are maintained. It’s something the show does occasionally – it went this way in Tom Baker’s second and third years and does it again in Colin Baker’s first and Peter Capaldi’s first. Each time, it emerged with a greater commitment to the Doctor as a figure of compassion, empathy and intelligence over brute force. But did I, as one of those kids you mention, “deserve better than this”? Well, what we kids got was the first Doctor Who story teaching us to read television, and to think about how television is constructed by producers and politicians alike. We got a story mixing the storytelling traditions of Greek theatre and contemporary television. One which had something to say about democracy, entertainment, colonisation and violence. One that blurred its fictional world with the techniques of its own production (watch the end of Part One to see what I mean). At 10 years old, it was my introduction to metatextuality and post-modernism. More than any other Who story up to that point, it prompted me to think beyond the surface level of a story. And despite its faults, it’s remained a story which Doctor Who fans (a far nicer bunch these days), return to time and again to deconstruct and find new meaning in. So no, I don’t think we did deserve better than Vengeance on Varos. On the whole, we were pretty well served with what we got. And we still are. LINK TO Snakedance: JN-T produced both. Plus both have guest stars called Martin. NEXT TIME: Talking of questionable levels of violence, we match wits with The Brain of Morbius, you chicken brained biological disaster! Here is a story which has a number of objectives: to be a bold and brilliant season opener, to be a celebration of Doctor Who’s history and to be a kickass Cyberman story. Script editor Eric Saward was so committed to this vision that when BBC rules prevented him from writing the story, he did so anyway and put his girlfriend’s name on it. Extraordinary really, that he had such a burning ambition to tell this story of gangsters, Cybermen and ice maidens that he’d deliberately deceive his employers to allow him to do so. Imagine risking your job and career so you could give the world Attack of the Cybermen. The first episode gives the best indication of what Saward was seeking to achieve. He offers us space mercenary Lytton (Maurice Colbourne) and his gang of crooks, apparently trying to break into a bank through the sewers. In fact, Lytton’s out to contact a random group of Cybermen, who are hiding out underground. These sections are sharply written and stylishly directed by Matthew Robinson. Although a common criticism of 80s Who is that it moved too far away from the creepy, tea time suspense that won the show so many fans in its earlier years, these sections are textbook Doctor Who. Interspersed with a subplot of events of the planet Telos, where Cyber-converts Bates (Michael Attwell) and Stratton (Jonathan David) are plotting rebellion, there’s a sense of something interesting and exciting developing, although through a bleak, mostly humourless filter. 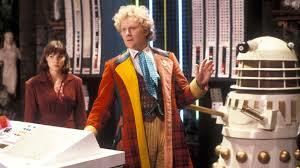 Weirdly enough, what really jars in this episode are our heroes, the Doctor (Colin Baker) and Peri (Nicola Bryant). He is in his trademark red patchwork coat, she in an eye poppingly tight, hot pink leotard. Whether it be against the stark white of the TARDIS or the sunny location work in some London backstreets, they stand out like dayglo paint splashed across a newspaper. Nor are they pleasant company to be with (to borrow a Saward-ism). They bicker and moan and swap needless continuity references. He’s a bully and a boor, she’s tremulous and shrill. And because they chase a couple of red herring plot elements for most of the episode, it’s not until they eventually descend into the sewers and tussle with some Cybermen that they finally intersect with the story. Frankly, up until that point, they are a garish distraction from more interesting things. Saward is on record saying that 45 minute episodes, an innovation in this season of classic Who, afforded greater opportunity for character development. But his approach to them is misjudged. It seems to have been to simply expand a 25 minute structure to 45 minutes; the same sort of scenes happen in the same order, they all just take longer. The result is that the typical first half of each of the episodes in season 22 seem unnecessarily slow. That approach would be unthinkable today, where there’s a constant need to engage and re-engage audiences with new incidents, ere they get switch channels or devices. And now we’ve had ten seasons of 45 episodes of 21st Who, we can see that what the 45 minute format needs is rapid, not leisurely pacing. Even if he was right, that with longer episodes comes a better opportunity to develop character, that surely demands that the characters are worthy of being developed. But these two fluorescent quarrelers, banging on about the chameleon circuit? Really Eric? And suddenly everything switches around. The Doctor and Peri become more agreeable and everything else goes a bit potty. But although we now have a TARDIS team we can feel comfortable watching (albeit with sunglasses on), the rest of the story loses focus. Where Part One concentrated on two or three plotlines, in Part Two they multiply like cybernised rabbits. Suddenly there’s a race to steal a time machine, the plight of the indigenous species (the waggily fingered Cryons, played by skilled performers giving carefully crafted performances completely hidden behind anonymous vac formed masks), a brave rebel waiting for her chance to a room full of conveniently stored explosives, rogue Cybermen bursting out of tombs, a plot to blow everything up, another plot to divert a comet into Earth, a reminder of what happened in some Doctor Who from 1966 and a quick shoutout to the Time Lords. It’s traditional to bash Attack for its overreliance on continuity details, long forgotten by anyone but the most devoted of fanboys (and blimey, if that twists your Tom Baker knickers, just wait until next week). But although it’s clunkily delivered, I don’t think that’s this episode’s worst sin. The Tenth Planet stuff is, after all, confined to one scene and is quickly moved on from. It’s more that Saward seems to suddenly want to include every possible plot line, as if he’s worried he’ll never get another chance to write anything ever again. This seems to blind him from some plot basics. For instance, the Doctor, although getting plenty of action is kept well away from the story’s centre, never gets a chance to confront his old enemy, the Cyber Controller (Michael Kilgariff). Considering Earthshock put the Doctor’s ideological differences to the Cyber Leader (David Banks) front and centre, that’s a conspicuous omission. The story ends with a sudden escalation of violence including the bloody crushing of Lytton’s hands and the Doctor in a firefight with the Cyberfolk. There’s no attempt to show the Doctor’s ingenuity or problem solving. There’s no attempt to sum up what the central theme of the story has been, which leads to the conclusion that this story’s full of sound and fury, signifying nothing. Except perhaps that the Doctor was wrong to assume that a ruthless mercenary was working for one side of an internecine war and not the other. Although Attack may not be “about” anything, it’s infused with one palpable characteristic: confidence. It has absolute confidence that it knows its fannish viewers and what they want. It has absolute confidence that they will be so fascinated, that they’ll stick around through a tricky format change, embracing the change of pace. It’s confident in its brash new Doctor, its ability to shock and thrill. When you think that a few short weeks after it went out that confidence would be shattered by the series’ first cancellation, there’s also something grand and tragic about its hubris. LINK TO Rosa: More Americans. Three stories in a row! NEXT TIME… Get your own stick! I’m in one of your hot countries to meet The Magician’s Apprentice/The Witch’s Familiar. We fans keep changing our collective mind about which is the best ever Doctor Who story. Is it Androzani? Is it Genesis of the Daleks? Is it The Day of the Doctor? We can’t decide. There are too many contenders. But when it comes to the worst Doctor Who story, we’re unanimous. Time after time we say, The Twin Dilemma. There’s been nothing as bad as that one, we’ve said, in the last three Doctor Who Magazine all-time surveys. As long as we disregard Dimensions in Time, which I’m more than happy to do. Ranking his debut story last among all Who makes Colin Baker sad, as we know from his 2015 interview with DWM. So sad that he questions the whole practice of mercilessly listing every story or every Doctor from best to worst. Unfortunately, this is what fans do. We list, we score, we compare. We ignore the good intentions, the extenuating circumstances and the mishaps beyond everyone’s control. We know which is the worst Doctor Who story ever, but we forget that no one on its production team deliberately set out to make the worst ever Doctor Who story. Quite the opposite, in fact, in the case of The Twin Dilemma where they sought to kickstart a new, vibrant era for the program. This blog is not about casting judgement on Doctor Who stories. I try not to tell you which ones I think are good, better or best. Although I’m sure I fail, maybe on every single post, I’m not here to review or rate. Partly because there are loads of other websites that do that already. And partly because I want to hear fresh ideas about Doctor Who. I don’t want to read another article telling me that City of Death‘s brilliant and Time-Flight’s not. If anything, I want to read the opposite. Facing The Twin Dilemma is a problem though, when something’s so famously, patently bad. It may or may not be the worst Doctor Who story in either my opinion or yours, but I think it can be overwhelmingly agreed that it’s not good Doctor Who. So I’m going to try to put that aside, in order to think about why we need a worst Doctor Who story in the first place. Apparently showrunner Russell T Davies described this story as “the beginning of the end” for old Who. Having just watched Survival, I have been wondering if this is true – if a five year wind down of the series started with The Twin Dilemma. If you subscribe to that reading, I think that helps explain our need for a “worst story”. We’re looking for a scapegoat to blame for the old series’ cancellation. I also think identifying the best and worst of something is an inherent part of fandom. I’ve written before about when I think fandom starts; for me, it’s when you seek out more information about the show than an average viewer would have access to. As part of this quest for knowledge, fans are building up a kind of expertise on the program. They develop opinions about what’s good and bad Doctor Who, as opposed to casual viewers who I suspect see any Who they watch as being roughly the same in quality. Fans are connoisseurs, and the ultimate expression of this is choosing not just good and bad, but best and worst. Then there’s a tendency to ‘pile on’ a particular story. Once The Twin Dilemma started to get its reputation as the worst story ever, it became harder and harder to watch it without being aware of that tag. It became easy for everyone to agree. A similar thing is happening to Fear Her, which seems to be gaining the unwanted notoriety of the worst new series episode. The more we all buy into this idea, the less likely it is to shift. So there’s scapegoating, piling on and fandom’s need to assess. The Twin Dilemma falls victim to all of these. Still, no smoke without fire – none of these things would gain any traction unless the story in question was dodgy to begin with. And there’s loads of material to work with here – ugly design work, flat direction, clunky dialogue. On top of it all, it ends with a direct challenge to the audience, daring its audience to dislike it. 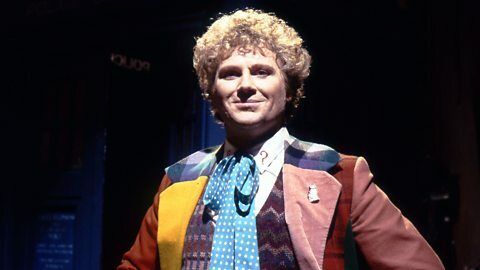 “I am the Doctor,” declares Colin Baker, delivering the story’s final line from within that colourful maelstrom of a costume, “whether you like it or not!” An extraordinary way to end a story, which speaks of a vast but misplaced confidence. This story was already playing hard to like, and then it ends with an invitation to its audience to bugger off. If The Twin Dilemma is about anything, it’s about the darker side of people, hidden under the surface. The sixth Doctor, in his post regenerative illness, releases a nasty, violent side which would have been unthinkable emerging from the gentle fifth Doctor. The story’s villain, the sluggy Mestor (Edwin Richfield) may be a laughably immobile, crosseyed panto costume, but the idea behind him, that he inhabits people’s minds, filling them with dark thoughts while lurking in shadows, is quietly sinister. Even the titular twins have the mental ability to destroy the universe, so we’re told. And it’s a theme that lasts throughout the sixth Doctor’s era, and culminates in the creation of the Valeyard, a supervillain created from the Doctor’s dark side. So the seeds of something interesting are there, along with a bold ambition to try something new – to present regeneration not as a blessing, but a dangerous gamble, and to move the Doctor to being louder, ruder and, in many ways, harder than ever before. Here is a strikingly different Doctor, inherently theatrical in words and action and openly confrontational with friends and foes alike. It’s near impossible to imagine The Twin Dilemma as a fifth Doctor story, but not so impossible to imagine a universe where it worked as an innovative and invigorating launch for the sixth Doctor. The beginning of something brilliant, not the end. Ultimately, being bad Doctor Who is only the first of this story’s crimes. The second is that it posited a brash new vision for the series that failed to convince the audience to go along with it. And while there have been lots of below par Doctor Who stories before and since, there have been none which managed that. So that’s why I think fans insist on having a worst story, and why we’ve collectively decided it’s The Twin Dilemma. None of which is any comfort to Colin Baker or to anyone else involved in the story’s production. What I hope is some comfort is that it wasn’t the beginning of the end. The series lives on loud and live, with a spiky, bad tempered Doctor at the helm. Plus the sixth Doctor hasn’t been shunned or quietly ignored; books, comics and audio dramas have crafted new Sixie eras which have garnered new fans. None of which would have been possible without The Twin Dilemma showing what didn’t work, but also what had the potential to work. LINK TO Survival: wildlife (birds and cats) anthromorphised into alien species. NEXT TIME: Life depends on change and renewal. Time to switch on The Power of the Daleks.